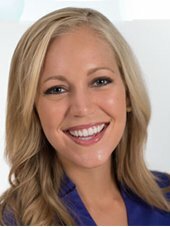 Abby Eden anchors the Fox 4 News Morning Show Monday through Friday from 4:30 until 9. Abby is originally from Omaha, Nebraska. She’s had the news bug since she was a little girl, always watching the local and national news, studying the reporters and anchors. Abby followed her desire to be a reporter to the University of Missouri in Columbia. There, she was involved in multiple student leader organizations including the Homecoming Steering Committee, the Honor Society: Omicron Delta Kappa, and she was a Summer Welcome Leader. Abby worked at KOMU through the University of Missouri, learning every aspect of the job from photography and editing, to producing and anchoring. She also interned at a non-profit organization in Buenos Aires, Argentina. Her first reporting job was in Tyler, Texas. She produced and anchored the weekend news in Tyler and reported for the evening newscasts in both Tyler and Longview. While she was there, Abby covered everything from crime to hurricanes. After three and a half years in Texas, Abby came back to the Midwest and to Fox 4. She started as a Multimedia Journalist working primarily in Lawrence, Kansas. Then she anchored the 10 p.m. news with Phil Witt for nearly six years. After getting married, Abby made the switch to the Morning show to spend more time with her new husband. Abby’s won multiple awards for her work in journalism including a Barbara Jordan Media Award, an Emma, multiple Emmy nominations, an NLGJA award, a MORE Award, and an Edward R. Murrow Regional Award. Her passion is telling stories that can positively impact people’s lives through investigation or education. In her spare time, Abby loves to spend time with her husband, Tyler, and their Australian Shepherd, Milo, and Hemingway cat, Dallas. Abby is a marathoner and half marathoner. You’ll often see her running or working out at lots of locally-owned gyms. She also enjoys trying new recipes and restaurants, attending local philanthropic events, and helping pageant contestants with their competitions. If she’s not in KC, she’s back in Omaha to see her entire family, including her seven nieces and nephews.